On Saturday 17th of March 2018, MIU Community Service and Environmental Committee, in cooperation with the Internship Administration Office, organized a field trip to Dar Face Belgian girls for orphans in Al Obour. The trip is planned in collaboration with the Ministry of Social Solidarity. A group of staff members, interns and nurses from the Faculty of Oral & Dental Medicine joined the trip. The purpose of the visit was to promote dental health awareness, and to improve the oral health conditions of the orphans. During the visit, the orphans were examined by interns and received cards with the treatment they need. 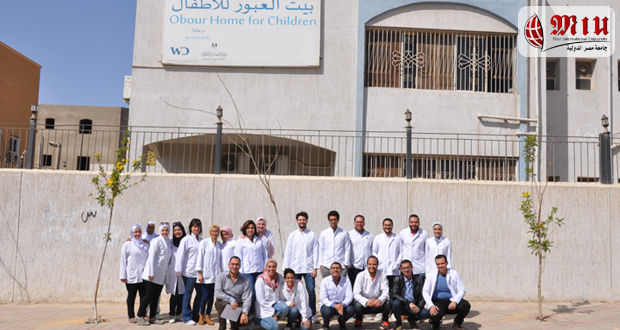 They were all invited to visit MIU Dental Clinic Complex to receive the required dental care. Four forms of questionnaires were distributed: one at the beginning of the session for the orphans to determine their dental health needs, the second was for the administrative staff to determine the needs of the orphanage, a third questionnaire (to the participants) at the end of the session to evaluate the provided program and measure their satisfaction. A fourth questionnaire was also distributed to the interns and staff members participating to evaluate the general outcome of the visit. Educational materials and packs of tooth paste and tooth brushes were handed in to all the participants.